Surrounded by mountains and hay fields, the K3 Guest Ranch Bed & Breakfast is just 10 minutes from downtown Cody. Use the K3 for an overnight stay, or as your base camp for exploring Cody, Yellowstone National Park, Grand Teton National Park, and all of the surrounding area. 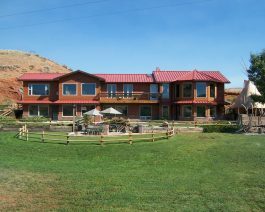 The Bed & Breakfast is located on what was once a working cattle ranch, and now boasts unique western-style rooms including a “chuck wagon” bed and a “hay wagon” bed. For a truly western experience they offer a retrofitted sheepherders wagon and family tent house. Enjoy a Western breakfast cooked over an open campfire each morning and served on the K3 garden patio. Open April 15-October 6. No Pets.